Consider yourself a person of bold fashion choices AND have 210 pounds ($280) to spare? In that case, the tube scarf created by Bulgarian knitwear designer label Dukyana could be just the winter pick for you. Beware, though: this piece of woolen clothing has no arm holes and is really a beige mohair tube that covers the entire body from the neck down, folding over the shoulders. Lots of people have lots to say about this product, some declaring that it resembles a giant sock. Dukyana is the trade name chosen by a Bulgarian woman called Milena Bunalova, who offers the clothes knitted by herself and her five-member team through third-party retailers and her own website. According to the label, the tube scarf (or sock dress or however you choose to describe it) is a fashion statement. Dukyana hopes the creation will become a hit this winter and sees it as an excellent solution for ladies who favor long walks out in the chilly air. The label also says that the fashion article does not stretch and hugs a woman’s body tightly. For all the assurances from Dukyana, shoppers can’t quite see the attraction, as the Daily Mail writes. The armless design is one of the gripes people have, saying the garment could pass for a giant sock but not a dress or a scarf. It also makes the outfit totally unsuitable for its intended purpose, that is, long walks in the open. On top of that, some critics say it makes women look shapeless, not to mention that the fabric gathers in places where no female wants any unsightly wrinkles. “This is a knitted straitjacket… for the winter,” as one person commented online. If nothing else, the weird outfit has provided a source of entertainment for social media users. They have been mocking the design by uploading pictures of their own attention-grabbing winter wear. One photo, for example, presents a cable-knitted onesie designed for men. In another one, young fashionistas with a keen sense of humor have made their statement by uploading a picture that shows them wrapped up in carpets held in place by gaffer tape. 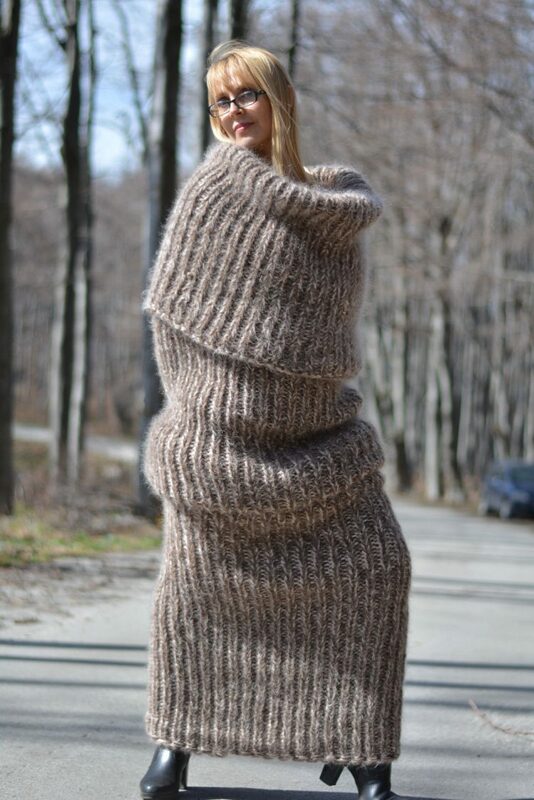 If you’re curious about the person responsible for this bizarre design, she appears to have found some success with her hand-knitted sweaters, dresses, coats, and accessories. Milena, a former teacher, has excellent reviews from buyers on Etsy: all but one of 79 are 5-star reviews (the dissenter has left 4 stars), and the brand has 1,546 admirers as of now. Maybe this time her creative impulse took her a bit too far but let’s wait and see the sales figures.